Today’s recipe is a simple one and the post brief, so, I though I’d take the opportunity to share another Grandpa story. If you’re not interested, just scroll down until you reach the peanut photo. That’s where the recipe begins. Grandpa was, by all accounts, a Jack of all Trades. Having owned a contracting business, few maintenance and repair jobs around the old two-flat fell outside of his skill set. At any given time, especially in the Summer, he could usually be found performing any one of a number of jobs around the building: cement work, carpentry, tile setting, painting, roof repair, and the occasional electrical project. As children, we were often enlisted to help him with these projects. When very little, our main duty was to stay out-of-the-way. We soon graduated to beer fetchers and water bearers. “Go-fer” was the next position and, depending on the project and number of men involved, we could be kept running. Soon we were allowed to water the dry ingredients to make cement, under supervision of course. Not long thereafter, we were permitted to use the hoe with 2 holes to mix the cement, as well as a variety of small jobs. You might, for example, fill buckets with cement, haul them, maybe cut a board or two, hammer a few nails, etc. And then, one day, you were deemed old enough and big enough to push a loaded wheelbarrow. That was the pinnacle of success for us laborers, for it meant that you big enough and strong enough to do man’s work. Make no mistake, pushing a wheelbarrow full of cement was certainly man’s work. especially under the watchful eyes of the adults present. You did not want it to tip over and there were plenty of opportunities, for every Summer there was at least one job that involved cement. To be sure, though, not all jobs required cement or even a work crew. For those jobs, Grandpa flew solo, like the time he painted the trim of the house. Unlike bungalows and ranch-style homes, painting a two-flat’s trim was no easy task. As you can see in the photo below, much of the trim is about 25 feet above the ground, with the peak another 8 or so feet higher. To further complicate matters, there were 2 aluminum awnings attached to the front of the house, a small one over Zia’s living room, while a much larger awning shielded our windows and the entire porch minus the entryway. (The photo is current, the awnings having been removed sometime after we left in 1985.) When Grandpa decided the trim needed painting, he was about 71 years of age. This was long before “70 is the new 50”; 70 was 70. I was about 15. One Summer afternoon, Grandpa called for me to give him a hand. By the time I got to the front of the house, Grandpa had already started up the ladder and was waiting for me. The ladder, however, was not long enough to reach the top, or even near the top, of the peak. Not only that but the awnings prevented it from resting against the building. Instead, it was on a bit of an incline as it laid across both awnings, its top-end suspended a little more than a foot from the wall. When he saw me, I was instructed to stand on the bottom of the ladder. Grandpa then began to climb higher. In his hand was a hockey stick with a paint brush lashed to the end. I started pleading with him to stop. He ignored me and further up he went. I didn’t know it but he had already placed a bucket of paint on top of the second awning. When he reached the end of the ladder, and with his left arm acting as a brace against the side of the building, he started painting the building’s peak, dipping his hockey stick brush into the paint can below him and then swinging it over his head. Whether because he heard my voice or just by luck, a neighbor came out and, horrified, ran to help me steady the ladder, all the while yelling, “Bart, get down!” Grandpa, of course, ignored him, as well. There was a job to be done, after all. Within minutes, more neighbors came, all pleading with him to stop. All for naught. As I’ve mentioned in other posts, the parish school was across the street and at the end of the block. At the time, Mom worked there as the school’s secretary. That day, being it was Summer, Mom left her office at 4:00 pm. She didn’t walk far before she noticed a crowd gathering on our lawn and quickened her pace. When she got close enough, she noticed Grandpa on the ladder, swinging a hockey stick. Now running, and a few doors away, Mom was yelling, “Pa! Get Down!” Unperturbed, Grandpa kept painting. When he had finished, the entire episode having lasted about 30 minutes, Grandpa calmly came down the ladder, handed his hockey stick to someone, went back up for the paint can, and came back down again for the last time. Mom and the neighbors demanded that he stop painting and he complied. In reality, his compliance was by no means submission. The peak was the last of the trim to be painted. His work was done. The men helped Grandpa put away the ladder and paint supplies. For that, he invited them back to “see my tomatoes.” The invitation had little to do with tomatoes but that’s better left for another post. For now, there’s peanut butter to make. When I first decided to make peanut butter for Max, he was still a puppy. Then, like now, he loved peanut butter over all other treats. Well, when I read the label of a jar of peanut butter, I decided to make my own. It’s easy enough, as you’ll soon see. I’ve chosen to remove the shells, roast the peanuts, and then remove most of the “paper skins” before making the butter. You must remove the shells but whether you roast and/or remove the skins is up to you, although I did read that roasting peanuts increases their anti-oxidant effects. That’s about all there is to the recipe. Yes, it really is that simple and your pooch can enjoy a treat without any additives whatsoever. Place peanuts, single layer, on a baking sheet and roast for 20 minutes. Stir midway through for even roasting. Once cleaned to your liking, place the nuts in a food processor and run. The nuts will go from coarse to finely chopped in a couple of minutes. Soon a “dough ball” will form. A couple of minutes more and a creamy peanut butter will develop. The longer you process it, the more fluid it will be. Place in an airtight container and store in the refrigerator. If using peanuts in the shell, roast for 25 minutes. Once cooled, remove shells and as much of the “paper skins” as you prefer. If your pooch prefers chunky-style peanut butter — very helpful if this is to be used to hide pills — remove up to 1/2 cup of the nuts after they’ve been coarsely chopped. Add them back to the peanut butter once it has reached the preferred consistency. Stir by hand to combine. To make peanut butter for the two-legged members of your household, follow the same method as dictated above. When the peanuts are first added to the food processor, you may wish to add salt, and/or a sweetener like honey or sugar, to taste. If you prefer your peanut butter to be more smooth, add a teaspoon or two of a neutral-tasting oil. I’ve seen no documentation that states the “paper skins” are harmful or should be removed from the peanuts, whether the peanut butter is intended for use by humans or dogs. Nonetheless, I remove the majority of them, though I’m nowhere near having them 100% cleaned. As I’ve mentioned, Max loves peanut butter. He has 2 hollow bones that I bought him years ago from a pet store. I put a couple of tablespoons of peanut butter in each and put them in the freezer. If I have to crate him, I give him one of these bones and it keeps him occupied. Dogs do not sweat as we do. They cool themselves by panting, sending cooler air over the tongue. Giving your dog a frozen treat on the hottest of Summer’s days will help him to keep his cool. With that in mind, I reward my puppy with ice cubes. When fully grown and Summer’s heat is at its worst, I give my dog an ice cube “treat”. He loves it and it will cool him off. In my part of the country, the farmers markets are at their peak. Sure, some fruits and berries are gone for the year but the vendor stalls are bursting with many other fruits and vegetables. Judging by what I’ve seen, my use of zucchini blossoms earlier this season didn’t affect their harvest in the slightest. There’s enough zucchini and Summer squash left to go around — and then some. 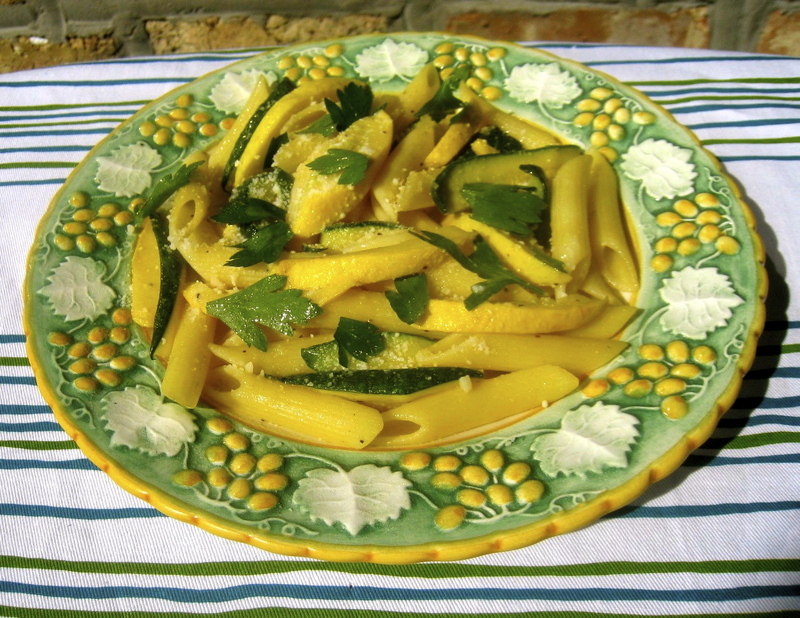 If you’re looking to use some of these squash, while cutting back on carbs, you might wish to check out this recipe for penne with zucchini and Summer squash. This entry was posted in Dog Treats, Gluten-Free, Vegetarian and tagged Dog Treats, Italian, Recipes by ChgoJohn. Bookmark the permalink. He was up there wearing his “pride & joy” – black high-topped sneakers which he’d purchased in Nova Scotia on a camping trip. I well remember him coming out of this old ratty little store with his “purchase” under his arm. And he was so happy that he’d got such a good price. We kids giggled (but not when he could see) ’cause we knew the price was low because NO ONE WAS WEARING HIGH TOPS in 1964 !! I’m glad you enjoyed this post, Cecile, and that it brought back warm memories of your Father. Grandpa, also, went up on the roof to patch it. I’ve no idea how he got pup there, nor does anyone else for that matter. All we know is that one day some black tar appeared on a small section of the roof over his bedroom. So does one dip a toast point into the PB for the pup, or just give him a spoonful? I remember one of my kids giving our dog a spoonful of PB and the poor dog couldn’t stop slurping and trying to open her mouth and get her tongue unstuck. I wonder how a PB and tomato jam sandwich would taste. Love the painting story, which reminds me that this 70 year old has got to paint the shutters before winter comes. I’ll have to get a hockey stick to do the job correctly. Maybe you’ll need some sort of fortification, Roger. Wait until you read about Grandpa and the “other thing” about his tomato garden. I don’t use that much of peanut butter, but the recipe still made me want to try and make it. I’m thinking sweet and salty. Thank you. Im glad you enjoyed the story. If you make your won peanut butter, you can make it as sweet or salty that you want. That’ the beauty of it. The end result is up to you and you’ll know exactly what you added. Read the label of a store-bought brand and you’ll see what I mean. 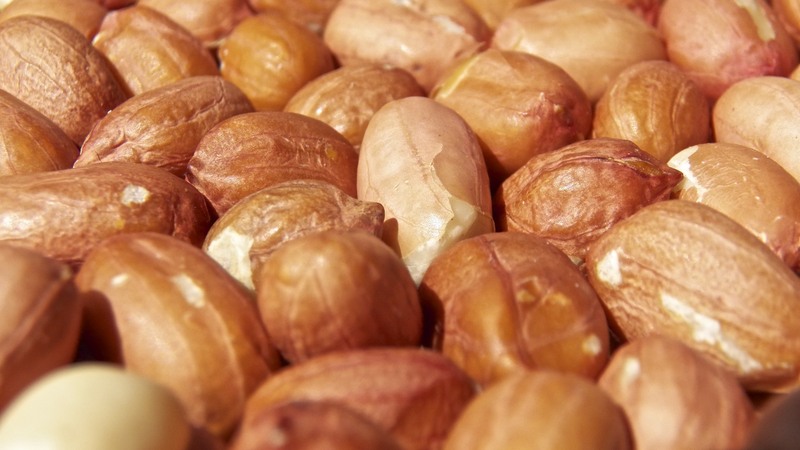 My mom used to freeze the roasted peanut before processed into smooth butter..
without freezing, the heat comes from the food processor will make te nuts and the oil separated!….. Your grandpa was a determined man! Love the story 🙂 peanut butter looks wonderful too! Thanks, Dimple. Yes, Grandpa was quite a character and I’m glad you enjoyed today’s post. What a man your grandpa was – I can just picture the scene and him “switching” off to all the nagging from the ground. My kitties also love peanut butter – it’s the funniest watching them lick at it. Never thought of making my own though – shall have to rectify that. Have an awesome day John. Thank you, Mandy. My cats loved PB, too. Should you make it, you’ll be amazed how easy it is to do and wonder why you never tried it before. I hope you have a great weekend! Haha, ageing makes you dogged ( pardon the pun ) if nothing else! My pooch loves PB, it’s perfect for hiding his pills in. Sharing with the canine members of the family. Well, their people! Love envisioning your grandfather and the gathering to watch him paint that peak. Your family stories are always good to read, John. And I discovered it was my trying to comment via iPad that was preventing the comment from being posted. I’m glad you enjoy these posts, Ruth. It’s always fun for me to write them because the memories come flooding back. It’s quite an experience. I can vividly recall seeing him swing that hockey stick over his head, painting that peak. I’m glad you got to the root of the problem, Ruth. It’s good to see you back! Your comments are always welcome and appreciated. WP quit supporting their iPad version a while back. I’ve pretty much quit accessing WP with my iPad because of it. Will have to try the peanut butter, and maybe Dedy’s hint along with it. Thanks for what to watch for as the peanuts get processed. We buy pure-peanut peanut butter, which looks pretty disgusting when it arrives home from the store with all that oil floating on top. I pour the oil into a pan to use in a stirfry! Ha! Good one! I will definitely share your Miller ad with my family. They’re going to love it! I’ve not had the problem that Dedy mentioned but I’ve got a heavy duty processor and it makes butter in no time, especially since I only use 3 cups of peanuts at a time. I will definitely keep his tip that in mind, though. puppy peanut butter! healthier for your pup! That was very kind of you, Elena. Thank you so much. I think homemade peanut butter is one of the best kept secrets of the food industry. 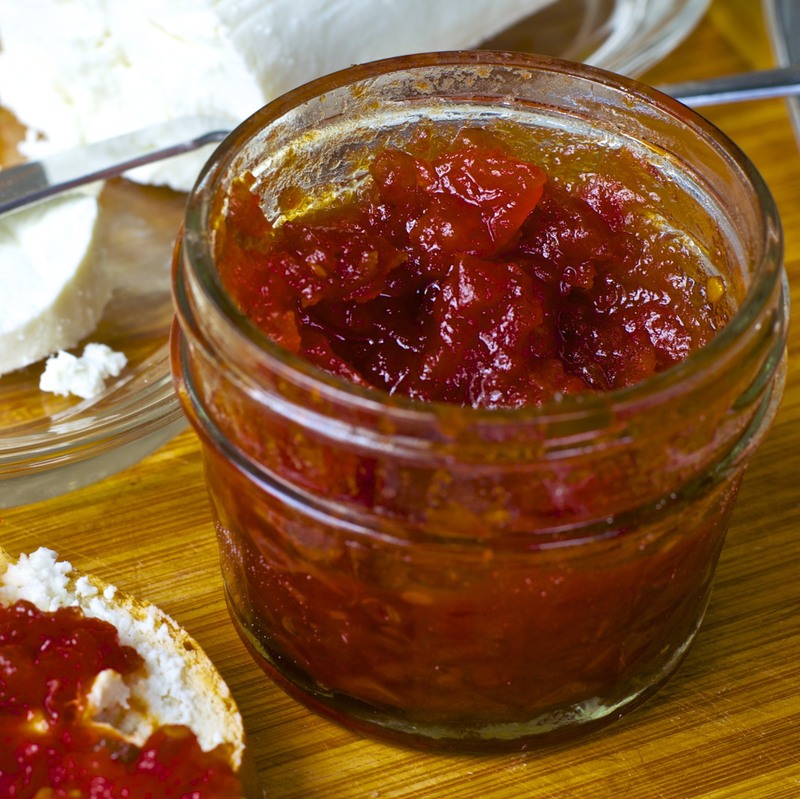 You’ll be amazed how easy it is and now quickly you can flavor it to your own preferences. Great story about your grandfather I wish I knew as much about mine. I have not had roasted peanut butter looks good! Thank you. I feel very fortunate to have been able to live for so many years with my Grandpa in the house. He was such a character! What an absolutely fabulous story. Do you think it’s something to do with their Latin temperaments that make these men in our families so damn stubborn?! I can totally relate to his behaviour and had to chuckle as I think your grandpa and my Big Man share the same name. Love the idea of making peanut butter for the pups and I know Luna and Alfi will salute you when I make it for them when we get back to Spain next week (and our food processor). I’m glad you enjoyed the tory, Tanya. I don’t know what propels them. Grandpa had a contracting company many years before and he felt that no job was too big for him to handle. Hire someone? You might as well proclaim yourself a devil worshipper for both were equally blasphemous. Max really loves his peanut butter. Being able to make it for him helps me to keep his food “clean”. I wish I could be so successful with my own diet! Safe travels back to your Mountain. Buon viaggio! As for the peanut butter, before I finished reading your post, I was about to ask you what about humans! I’m glad you didn’t forget about the other “pets” in the family. I will try this recipe very soon, thanks for sharing! Our dog enjoys peanut butter treats too! I haven’t made it yet and just might have to try it out. I just get the natural PB made of only peanuts and salt, with the three boys we go through a lot! Quite a character. I have a picture in my head of your Grandpa at the top of the ladder, you and your neighbors steadying the ladder and anxiously waiting for Grandpa to finish the painting and get down from that ladder. What a relief it must have been for all when his feet finally touch solid grounds. That’s got to be the longest 30 minutes. There is a food market near me where I can go to ground my own freshly made peanut butter from roasted peanut, pricy, but since I do not use much PB it serves my purpose. Thank you, Norma. The picture in your mind is just about exactly as the scene transpired. I remember it so well. Aside from being so easy to make, it is quite cheaper than any you can buy. Considering how expensive dog treats can be, this is a real money saver. I’m sorry but as I am dreadfully allergic to peanuts I must back away quickly from this post and return when it it allergen free 🙂 Great recipe though for the puppers. Step away from the monitor!!!! Yet another great story my friend, your grandad must have been a force to reckon with. I used to really love working with my Dad, he was always so patient letting me learn to do things the right way. These are the life lessons that have made us the people we are today. You were very fortunate to have had your grandfather and although your Mom and Dad may have rolled their eyes more than once or twice at the risks he may have taken, I bet they were down right grateful that they didn’t have to a) hire someone to do it, or worse b) get on that ladder themselves to do it after a long day at work. I bet you had the nicest looking house on the street. I meant to say a few words about the PB; I’m quite impressed! I had no idea it was so simple! But perhaps I just never thought about it. We always buy the natural stuff from the health food store, but making your own sounds super easy and fun. I really can’t stand the grocery store variety. On another note, I was waiting to check out at my local grocery store recently and picked up a container of powdered bouillon, a very well known brand in fact; ingredient #1 was salt and #2 was MSG! Is it even legal to call it chicken bouillon??! Your experience mirrored mine when I read the peanut butter label. Yes, peanuts were first — how could that bouillon company get away with that? — but it was quickly followed by high fructose corn syrup, salt, sugar, etc. When you see how easy it is to make, why bother with the other stuff? I buy a 4 lb bag at that Indian market for a couple of dollars and it keeps Max in peanut butter heaven for months. You can’t beat that. John–Great post and lovely story about your grandfather. You’ve also got a lucky dog. 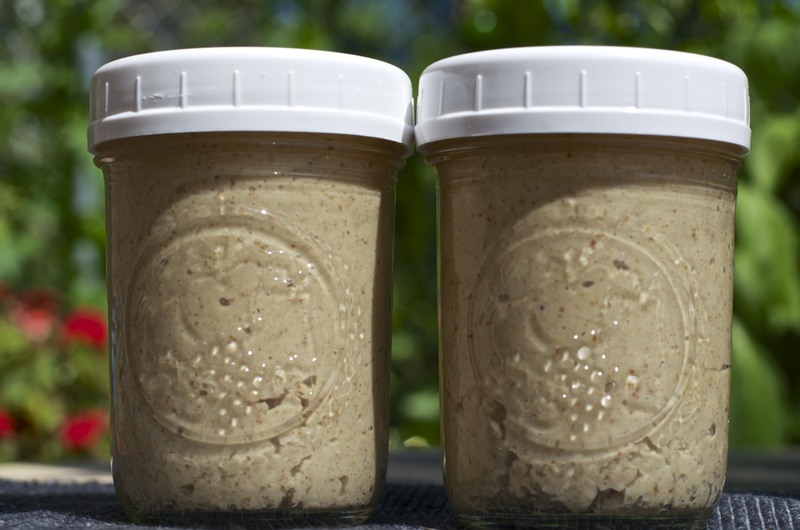 Do you ever make nut butters for yourself? Oh Bart, you rascal. Cute story. I’ve never made peanut butter for Charlie but it makes sense. I have put some peanut button on the roof of his mouth once – just to make him “talk”. LOL I’m bad. Maureen, you don’t know half of the things Grandpa did or was capable of. To this day, the family cannot get together without stories of him being mentioned. He was a “rascal” all right. Dogs go crazy for peanut butter! When they know we’ve put some in their kongs and in the freezer for when we head out, they can’t wait for us to leave. Cupboard love! Max heads to his crate whenever he sees me loading up one of his bones –even though it’s going straight to the freezer. He looks so dejected when he finally realizes there’s no PB coming his way. Actually, Celi, you and Grandpa would have gotten along famously. He would admire your “can do” attitude. You two are kindred spirits in more ways than you know. Boo is young, Celi, and this is the time to get him hooked on it. It’s a life saver down the road if you need to give him pills and, right now in the heat, frozen peanut butter is a great way to cool him off when you can’t be around to hose him down. Now why would we scroll past a story about your Grandpa? Look what we would have missed! I would have been scared holding that ladder! Thank you, I’m glad you enjoyed the story. I was in a no-win situation. He was going to paint that peak with or without me and it was a bit safer with me. Thank heavens our neighbor came out and helped me steady that thing. I love reading your stories John! This one’s priceless! Grande Nonno ,Jhon,really determinated man,I’m really happy I have been reading the story!thank you. John, your grandpa sound just the type of person I love. If there is a job to do, then it must be done. We have a joke in Australia about Italian migrants and how much they love cement because the previous generation tended to cement everything in sight. Your peanut butter sounds fantastic, don’t let Max eat it all, save some for yourself. Thanks, Glenda. (Please pardon my earlier mistake.) You pretty much described Grandpa to a “T”. Every Summer, there was some project, big or little, that involved cement. At one point, Mom even wrote “The End” in some wet cement to signify that there would be no more cement poured in the yard. In the end, it meant nothing. I do make peanut butter for myself but, to be honest, I often confuse the containers and Max ends up with it all. That’s OK. I’ve always got peanuts and it’s easy enough to make a batch. Great story about your grandpa! Did inspecting the tomatoes involve some liquid refreshment? 😉 I just roasted raw peanuts for the first time this summer. What great flavor! Haven’t made my own peanut butter yet – I’m looking forward to that. Fun post – thanks. I, too, was surprised to learn that roasting peanuts increased their anti-oxidant properties. I do it for flavor and it’s always good to learn there’s a health benefit, as well. Have a great weekend, Laura. The Grandpa Bart story is a classic! I am thinking the two-legged runner in my household may enjoy giving this PB recipe a try and then I will ask him to share it with our 4-legged friends. Yes, Kat, as you get to know Grandpa, you’ll see that this story is another classic Grandpa story. There are more to come. I think it’s a secret you find out when you get to 70 that it’s not as old as you thought… and you can still do stuff like climb ladders to roofs and scare the bejesus out of everyone 🙂 I love your recollections of the increments of being called to assist, rising through the hierarchy to the peak of wheelbarrow pushing. 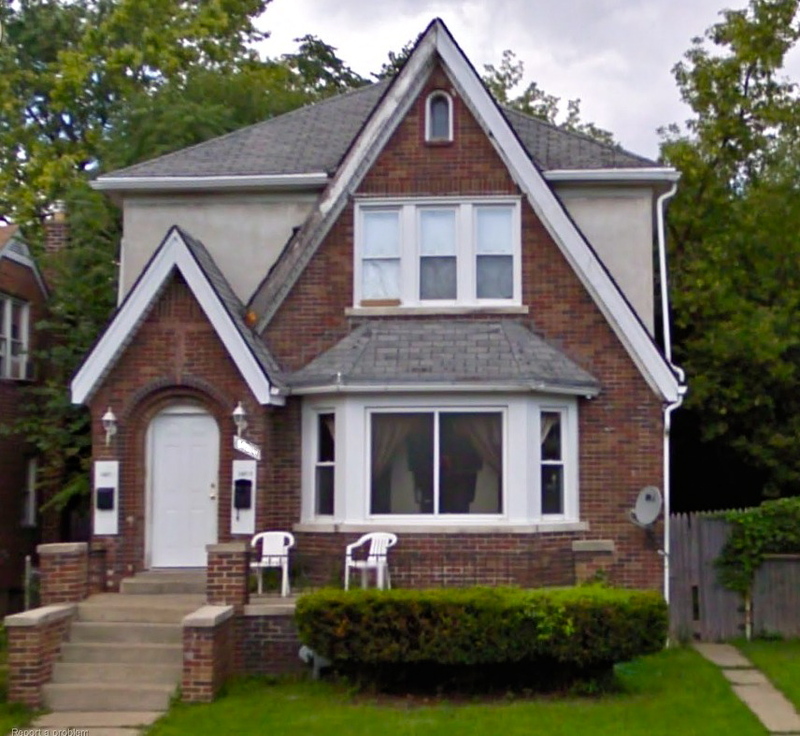 I also, like Glenda, laughed about the cement, there are still quite a few concrete front yards here. Love the PB recipe, a reminder to us that there’s no need for the store bought stuff. My Bo loved ice cubes as well, and I often gave her frozen lamb shanks (they were inexpensive way back before they became trendy) in summer too. Great post. I love family stories. Thanks, EllaDee. I’m glad you enjoyed the post. Had he not been stricken by cancer, I think Grandpa would still be here with us, working on something. He was tough as nails. As I told, Glenda, Grandpa poured cement every Summer. Mom even wrote ‘The End” in one patch of wet cement but to no avail. Grandpa kept on mixing and pouring. What a classic grandfather story! I laughed, thanks for sharing. I don’t have a pup, but this seems like a fun (messy?) project. Thank you, Mary Frances, I’m glad you enjoyed this story about Grandpa. I buy the peanuts shelled so that’s one less mess to clean up. As for the paper skins, they do come off easier once the peanuts are roasted. Taking them outdoors, as I suggest in the post, is a great way to remove the skins and keep the mess out of your kitchen/home. And it tastes so good! I don’t have any pets, only children and thankfully they like peanut butter! I was thinking to make some actually, esp since I replace my processor, finally. What I can’t wait for is your tomato jam. Looks delicious! Thank you, Nazneen. If you can see your Grandfather on a ladder, than the 2 men are quite similar. You’re right. They don’t make ’em like that any more — and that’s a shame. The Pupster Peanut Butter is going to be fun to try. What a great big mess the paper skins will make, the boys will LOVE that. You’re a great Mom! Yes, your boys will love making the mess. I hope you take a few pictures. They’ll be priceless. Good luck. What a sweet Grandpa story! You had me smiling because that is so typical of Italian men of that generation, no? Nothing would deter them from getting a job done around the house. And god forbid paying someone to do the work! What a luck puppy to have a human who loves him so! Loved the story and the recipe. I am currently making frozen peanut butter Kongs for Gidget because unfortunately she is not an 11 month old street dog but more like an 8 month old street dog. But since she likes peanut butter she now loves crate time. Thank you, Francesca. Every dog that I have owned has loved peanut butter. Though allergies are possible, none of my dogs have experienced a peanut allergy. When my dog has been allergic to a food, it has been nothing like the human allergic reaction. Max is allergic to a particular brand of dog food and he gets ear infections when he eats it for a while. One feeding will not cause a reaction but, since you must buy dog food by the bag/box, his ear problems appear after about 10 days. Does Max have any idea how lucky he is that his buddy goes to the trouble to make him fresh, homemade peanut butter. We love it. 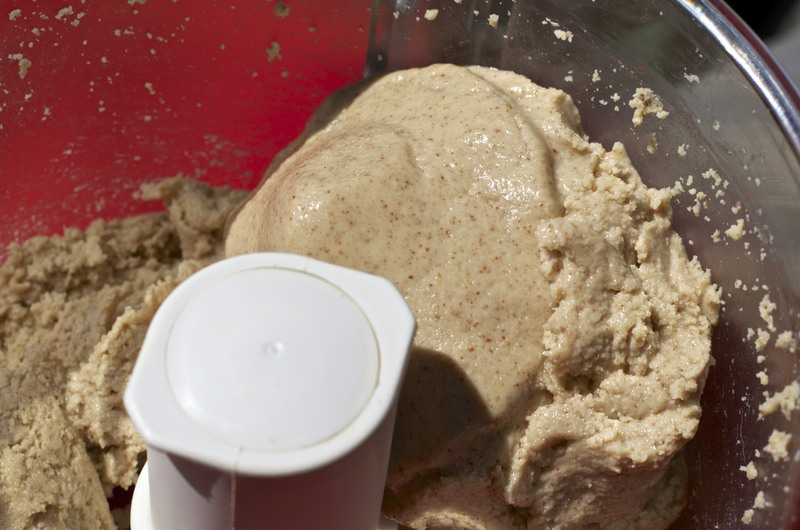 Have you ever made cashew butter? That is probably my favorite. What a great comment, Richard! Your soon-to-be lawyer Son’s plans for you cracked me up!. Thank you for that. I monitor Max’s diet quite closely. Cancer is the humber one killer of dogs and boxers have the highest incidence rate. Being Max is a boxer-mix and having lost my last 2 dogs to cancer about a year apart, I’m determined to give Max the best chance possible for a long, healthy life. Processed foods are not a part of the plan. I should be so careful with my own diet! I forgot … I’ve not tried cashew butter but I will now. Thanks for the idea. Thanks, Anne. Though I’ve no experience baking with my own PB, I would think more salt would be needed when it’s used in place of store-bought PB. Mine has no salt or sugar, unlike the popular brands. I guess it would be like using regular or unsalted butter in a recipe . Thanks, Saskia. Grandpa was quite a character. This peanut butter is so easy to make and there’s not a bit of high fructose corn syrup in it. Your kids will love it and, if you feel it needs sweetening, you can always add a bit of honey with ease. Your crate and PB-filled bone comments were too funny! I think parents who travel with children — be it to a vacation spot or the grocery store — deserve a medal. I remember how we were and don’t know how Mom & Dad did it. Now that’s a funny story, I think I would’ve really liked your grandpa, he was spunky wasn’t he? I liked that he invited everyone to see his tomatoes! We forget about recipes for our 4 legged friends, I think my little Jack Russell, would love this John! Thanks, Tanya, I’m glad you enjoyed the story. There are more to come, to be sure. If you Jack Russell is at all like the dogs I’ve had, he will certainly love it and you won’t worry about giving him processed foods or high fructose corn syrup. I love your family stories, and your grandpa sounds like such a character. His lack of “common sense” in the line of duty and getting a job done to his own satisfaction reminds me of my husband. He does things (at almost 70) that shouldn’t be tackled, but there is no dissuading. And I love the comment, John, that it was when 70 was still just 70, not a decade and a half younger. LOL! Your Grandpa story made me smile. Love his ingenuity with the hockey stick and his apparent calm determination! I’m a peanut butter fan, too! I just love your stories and they remind me of my husband’s childhood…especially going ’round back to check the tomato plants. Ladders scare me & I never understand why my husband thinks that me footing the ladder for him actually makes him feel secure. Every year he’s up over 2 stories cleaning the gutter with the ladder balanced on a jerry rigged platform because it’s on a slope. One year I wasn’t footing the ladder & I heard all kinds of yelling and screaming out back. You see he didn’t tie off the rope & our former Berner saw the dangling rope & thought…”oh pull toy”. So Spirit was yanking of the ladder’s rope while my husband was hanging off the gutter and I was in the kitchen deciding if I should grab the video camera. Lola thanks you for the treat recipe. My husband remembers Sunday dinner at his grandfather’s house. Always had the jug of homemade wine under his chair & the kids always got a little glass of their own – ‘good for their blood” was what he always said. Yes, I did leave the camera & ran to the rescue but I was laughing so hard I’m not sure how much help I was steadying the ladder – first thing was to get the rope out of the dog’s mouth. But he did learn his lesson – when you have a big dog around helping you, TIE OFF THE ROPE! Gosh, Diane! I’d forgotten all about that jug of wine under the table. It was as much a fixture as were the table legs! Enjoyed your prose per usual. Thanks, Liz, I’m glad you enjoyed the post. They just don’t make ’em like our Grandpas anymore. One of my Cousins has a grape arbor in his yard that he started from cuttings of Grandpa’s vines. I would love to do the same but my place just isn’t big enough for one. Thanks, Betsy. I’m sure that if Grandpa had lived longer, he never would have slowed down. As it was, he was told to take it easy when health issues arose and he ignored the doctors. In ways that were astounding to all of us. He was a real character. Like you, I was so surprised when I learned how easy it was to make peanut butter — and how much healthier. Believe me, Max couldn’t be happier! SInce you’re dealing with a two-legged member of your household, you may need to add a bit of salt or honey to improve the flavor. My advice would be to make a small batch — say 1 cup of peanuts — and experiment with the flavors. After that, make as much as you want. Good luck! Good advice, John, and thank you! I’m glad you enjoyed the story, Kristy, and that it brought to mind your own Grandpa. They were part of a vanishing breed, weren’t they. I bet you know exactly what that invitation meant. Not to worry, I’ll tell all within my next post. I LOVE THIS! I really like the thought of making my own peanut butter. I am going to be a hero in these parts. Fabulous story about your grandfather painting. I like people like that – folks who know what has to be done despite what everyone else says. As an aside, I tried Risotto on the weekend but I strayed dramatically from your recipe and it showed. It wasn’t terrible, but it really needed more time & attention than I was able to give it. Am going to try it again, however, and stick a little closer to your instructions. My hands were sweating at the part where you and the neighbors were at the bottom of the ladder and your Grandpa (at 71) was on top – Painting! Wow! When I grow up, I really hope I am like him! LOL … Don’t try to be like him too early or you may not make it to 71!! You can make this PB really quickly and easily. You’ll be surprised when you make it the first time. Thank you and I’m glad you enjoyed both the story and recipe. Skip over a Grandpa story? Never! I must say, that man had tenacity (he would have made a good food blogger had there been such a thing then 😊). Loved your line that back then, “70 was 70.” I wonder how it is that we all think of ourselves as so much younger than we really are? Mind you, it’s a good thing, as long as we’re not being ridiculous about it 😊. That peanut butter would be a great treat for a dog, and I think also for a human who likes a peanutty treat (although I think I’d have to add a little salt). I think today people are in much better shape than ever. In the past, many barely made it to retirement age. It was quite rare to meet someone that had lived into their 80s. Now we think it is too young when someone passes while in their 70s. As for the PB, a bit of salt and maybe a little honey wouldn’t hurt. All you can do it give it a try and find out. Good luck! hahahahaha!! You had to give it to the old man – what guts!!! Wow!!! I was laughing at ’70 is new 50’…heheheh! I held my breath through out…..so glad it ended on tomatoes. Well, believe it or not, your grandpa sounds somewhat like the man I married. If he can do it, he will. But I am can be quite forceful and don’t take it lying down, so he sometimes caves in just to avoid a hell he gets afterwards, lol!! I especially hate it when he gets up those tall ladders……and I can feel the fear in my mouth and it’s not pleasant to have sweaty hands..And that’s not fair. I had no clue it was so so easy to make peanut butter, I am like, wow!! But I don’t yet have a food processor, so I am wondering – will blender work? Thanks John! That’s a helpful hint. I must try this. I’m so glad your Grandpa is all right, Barb. I know he gave you all a fright! He and my Grandpa were very much the same. Even had he fallen, I’m sure Grandpa would have gone back up that ladder the next time it was needed. There just was no stopping him when he saw something needed to be done. Giving a dog a toy/bone filled with frozen PB will keep him licking for a good while until the PB melts. Be careful with bones, though. Max has had these 2 bones for years and I know he cannot break them into shards. I never leave him with a new bone. I want to be around if he breaks it so that I can take it away before he injures himself. There are plenty of hard-rubber toys that can be used if you’re not certain about the bones. I bet your MIL knows which are best for her pupster. Good luck! That was a story full of suspense. It’s a joy to read when writers shares something personal and something special. Remembering our memories with our family keeps them close in our hearts. Great recipe too! I love reading stories about your family. My dad is 77 and when I went over to his house a few days ago, he was on the roof trying to fix his tv antenna! He’s happiest when he’s puttering, I just wish he would stick to puttering on the ground. We can grow peanuts in our area. Have never tried making peanut butter though and I’ve never given it to my dog. she would probably love it. thanks for the recipe. Gosh,do you bring back memories! yes, that is exactly the thing Grandpa would have done, ignoring all of us ground dwellers. THere just wasn’t any way to dissuade him. John, what a wonderful story I could just see him up on that ladder with the hockey stick. Men are funny creatures aren’t they? Oh, perhaps you might not agree falling under that category. As many as I’ve had the pleasure of knowing in one capacity or another over my lifetime, I’ve never really been able to convince any one of them to do anything they had a mind to do if serious about it. Best to just stand back and do damage control I’ve found. The peanut butter recipe, although I’m sure irresistible to Max, probably would probably be less than well received by Boo the Cat. Thanks, Susie, and from my experience with cats, they never quite got beyond PB’s ‘stick to the roof of your mouth” capacity. Max, on the other hand, will actually use the side of his crate to clean his tongue, going back to this “reserve” once he’s cleaned out the toy or bone. The dog loves his PB. I too was fortunate enough to have a wonderful grandfather. Unfortunately he died when I was six. Before he went he was my yardstick for what a man could be. Still is. No dogs, but loved the story about your grandfather. Thanks, Karen. I imagine that you probably travel far too much to have a dog. I have family and friends who love dogs but, like you, are away from home far too frequently. I always wanted to make peanut butter, but at this point, my dietician is always on my case when it comes to me enjoying peanuts or any type of nuts. Anyway, I am looking forward to your tomato jam recipe. Have tomatoes–will CAN them!!! The jam is coming. I made 2 batches and they helped to bring my tomato harvest under control. I hope you’ll be able to say the same. Your really…vivid Grandpa story makes the recipe special – enjoyed it a lot (the story I mean 🙂 ). Hmmm .. someone’s got Rosetta stone? Love those stubborn Grandpas! 🙂 What a character! Your recipe for peanut butter looks wonderful! Looks like a great treat for pups and ponytails alike!!! I think the girls would have fun making this and they’d be surprised by just how easy it is! 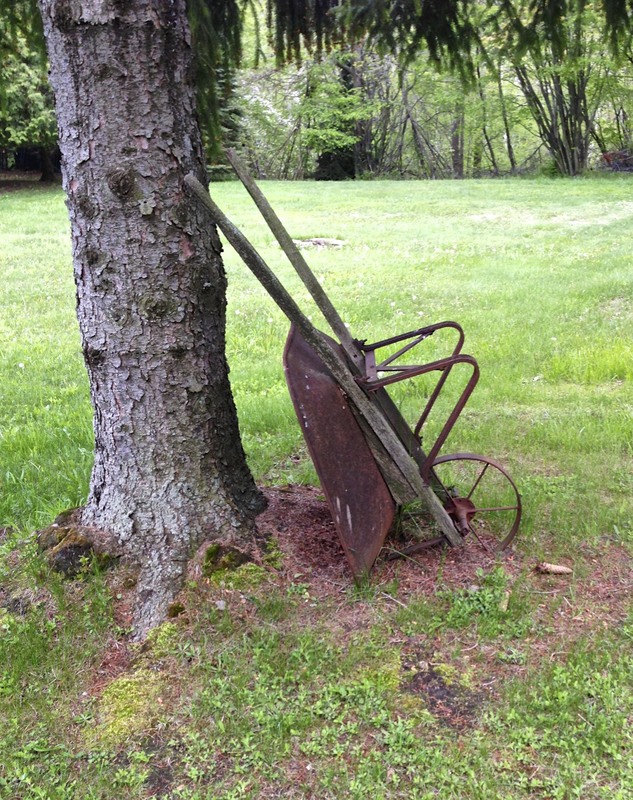 Your grandpa sure had lots of uses for that old hockey stick! A gardening tool and a painting device! Hey, Barb! Yes, you’re right. I bet your girls would enjoy making PB on their own. I’ve suggested to others to start with a small batch the first time to see if salt & honey/sugar are needed, if the PB is to be eaten by two-legged family members. Once you get the taste you like, you can always go bigger with the next batch. WHen cold weather hit, we boys went on scavenger hunts, looking for our hockey sticks. No telling what Grandpa had done with them and whether any had survived. There was so much fun in Ontario over the weekend, there was no way I could have made it until today. Thanks you John, for sharing this hilarious story about your Grandpa. If I was there, I would have preferred never to grow up and just enjoyed the main duty of ‘staying out of the way.’ Your Grandpa was a very talented man, who would have thought of having a ‘hockey-stick-paint brush’ and he was Gutsy, too. I bet some of the female neighbours gathered round the ladder were looking up with their eyes closed, and yelling tops. If I can’t stand looking at something, I just close my eyes, it helps a great deal (thank God we were adorned with eyelids). I always remove the “paper skins” (what a name! ), I find them bitter and I love the chunky peanut butter version, with crackers, Marie or Rich tea biscuits or just a slice of bread. Thanks for the ‘ice treat tip’ although I don’t have a pet. My best wishes to Max and thanks again for being so patient and gracious. Have a fabulous week, John. Thank you, Liz. Yes, keep busy now for it won’t be long before it will be too cold to do much outdoors. Grandpa sure was a force to be reckoned with. Once he set out to perform a job, there was no persuading him otherwise. It was either help him or get out of his way. Peanut butter has been a life saver for me with my dogs. They’ve all loved it and it makes medicating them so much easier. Getting your puppy to think ice cubes are treats is another life saver. They really do help cool the animal down. Max thinks baby carrots are treats, too. It’s a good thing he doesn’t talk to the other dogs in the neighborhood or I’d be in big trouble! Thanks, Liz, for your visit and for always leaving such great comments. Have a great week. This is one of my all-time favorite John posts. I just love this story. Tell Max, too, that Chase absolutely loves the pupster recipe. It’s better than Pill Pockets and he appreciates having this for the nasty ol’ pills he has to take. Thank you John! Hi, Sarah! Yeah, this is a good “Grandpa story.” There are more, you know. He was one of kind, that’s for sure. I started to tell Max about Chase and he was interested — until I mentioned “peanut butter.” After that, his eyes got the same look a 5 year-old gets gazing at a birthday cake. I’d “lost” him. I am glad Chase would like this PB. It really is a life saver when it’s pill time. Have a great week, Sarah! My dog would have loved this. She adored peanut butter. All of my dogs have loved peanut butter, too. Considering the “stuff” in some of their treats, this is the way to go. What a great memory. While I have no dog, seems this would be fine to eat myself! Enjoyed every single word of your Grandpa memoir. i love making my own PB but sometimes I go way to complicated with it. I like your simple approach! I don’t want anything but peanuts for my dog(s). When I make a separate batch for myself, I’ll spice it up a bit, though not always. Thanks for visiting and taking the time to comment. How long will the peanut butter keep? I will have to make a batch of this for my dad’s pups the next time I go home for a visit. Hi, Amber! Most sources I read said that homemade PB should be refrigerated and will last months. I use half-pint jam jars to store it and line them up on a refrigerator shelf. I’ve never had it around longer than 4 to 6 weeks and there was never a problem. Hope your Dad’s pupsters love it as much as Max. Love reading your stories. Grandpa was a mighty man. I sure he could tell a wonderful story as well. I was really feeling scared for him as well. Thanks for sharing. Thank you, Francine. Yes, Grandpa could tell a story. He’d lived through some interesting periods of history and it was wonderful to hear his views.